Our national network of courthouse researchers will perform a manual search for felony and misdemeanor records at the local county level. Liberty utilizes a national network of courthouse researchers to cover the more than 3,100 counties across the nation. Our researchers search both the Superior and Municipal court criminal records to discover any felony or misdemeanor charges in that jurisdiction. Our national turn around time is 1.91 days. The following items are covered in a criminal record search: subject name, date of search, search period, type of record, applicable charges, case number and final disposition. History has proven that previous criminal history is the greatest indicator of whether an individual has a propensity for further acts of violence and theft. Statistics show that 80% of convicted criminals are repeat offenders. Your employees are one of the most valuable parts of your company. Proper screening of new employees helps to ensure that you are not putting current employees at risk from an individual with a history of violence or theft. The U.S. district courts are the trial courts of the federal court system. The 94 U.S. judicial districts are organized into 12 regional circuits (map). 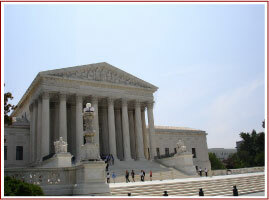 There are two types of cases handled by federal courts, criminal cases and civil cases. Federal criminal charges are initiated by the government, usually through the U.S. attorney's office in coordination with a law enforcement agency. Individuals file civil cases, not the government. Liberty searches the 94 federal districts found in the Unites States to discern any records available that fall under federal jurisdiction in the district specified. The following items are covered in a record search: subject name, date of search, search period, type of record, applicable charges, case number and final disposition. Protecting your company from applicants who have previous records involving tax evasion and embezzlement is essential to the success of your company. These are just two of the federal crimes that are uncovered in this search. Employee theft costs U.S. business more than $4 billion every year. Statistics prove that employee theft is responsible for approximately 30 percent of all business failures in this country. Our national network of courthouse researchers will perform a manual search for all cases of civil litigation at the local county level. Our researchers search both superior and municipal court records to discover any civil litigation in that jurisdiction. The following items are covered in a record search: names of plaintiff and defendants, date of search, search period, type of record, type of action, case number and status or final disposition. Most people do not realize that an individual's history of civil lawsuits are not identified in the course of a criminal record search. Liberty's verification of a candidate's civil history will provide your company with information regarding the litigious nature of your candidate. A litigious employee can potentially cost your company time and money.